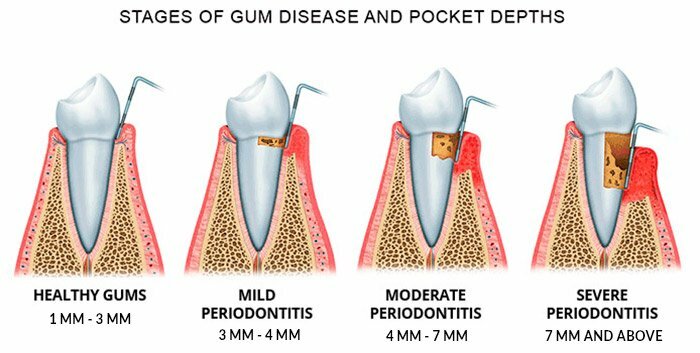 For Americans in their 30s and beyond, the risk of gum disease (periodontal disease) is a very real and serious condition. Gum disease is very dangerous because the progression of the disease is almost always painless. Thus, gum disease going undetected until it creates serious problems. Genetics plays a small role in its development; dentists agree that gum disease is more directly related to how well patients care for their teeth and gums. 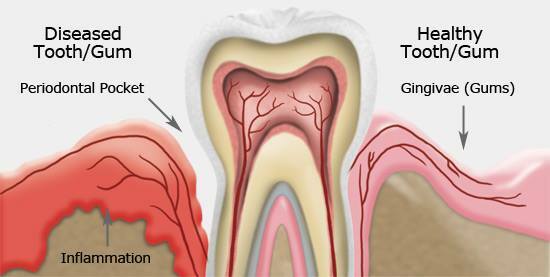 Periodontal disease is a gradual bacterial infection of the gums and the supporting bone. It is caused by the buildup of plaque on teeth calcifies into tartar. This tartar is super structure of bacteria that now is fused to the teeth. 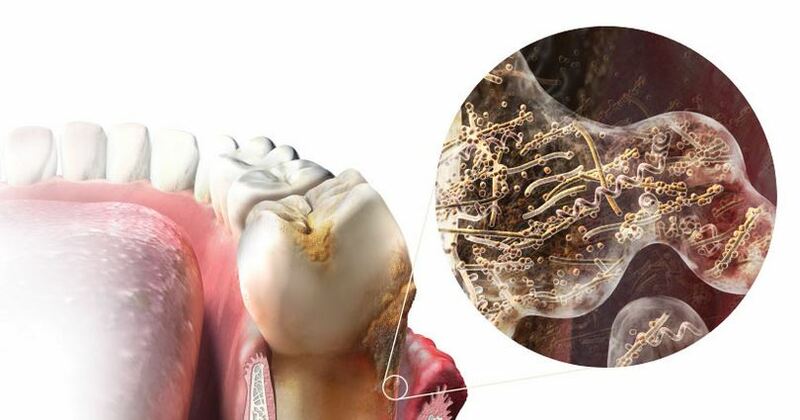 The bacteria release toxins causing the first stage of gum disease known as gingivitis. Gingivitis is characterized by swelling, inflammation, and bleeding of the gums. Left unchecked, gingivitis leads to advanced periodontal disease. The jaw bone will resorb or dissolve in response to the bacteria toxins. 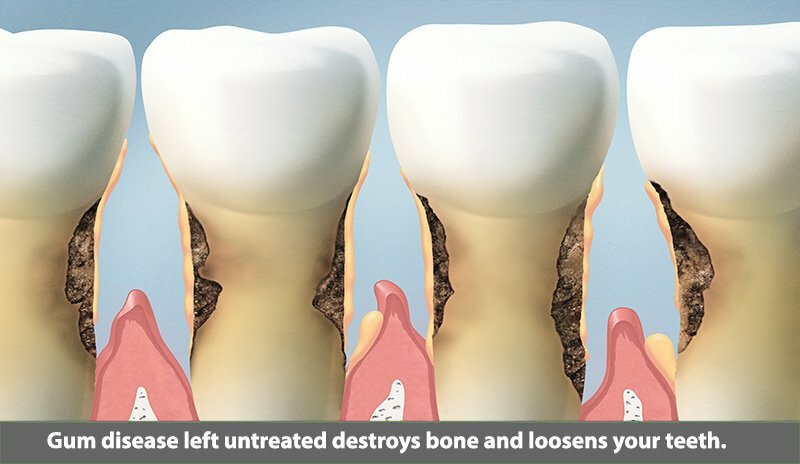 The teeth, having lost a part of their bone support, begin to move and become loose. Treatments to eliminate gum disease include deep cleaning, laser therapy, home care & regular follow up care. The Hygienists begin by removing the diseased tissue, tartar, and plaque from the tooth’s surface and below the gum line. The devastation of periodontal disease are best prevented by early detection and proper dental hygiene. Brushing your teeth twice a day with an electric toothbrush helps to remove the thin layer of bacteria that release dangerous toxins into your mouth. Furthermore, flossing is important to keep your mouth free from residual food and bacteria. Next, using a mouth rinse to kill bacteria is beneficial. Finally, maintaining a balanced diet and scheduling regular dental appointments help stop the advance of gum disease and keep you healthy and smiling. Get the best dental care for you and your family. See why our Pasadena, Texas dental office has been voted Best Dentist in Pasadena Texas multiple times.